I probably have used that famous HDT quote before in a post, but it is so apt. 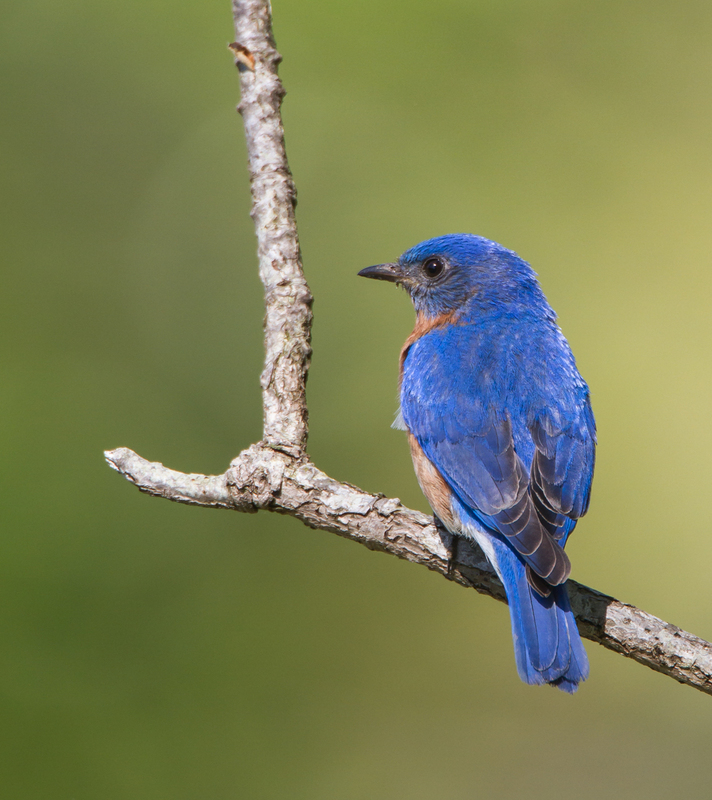 Although the color of a male is so intense this time of year that it exceeds even a perfect Carolina blue sky. 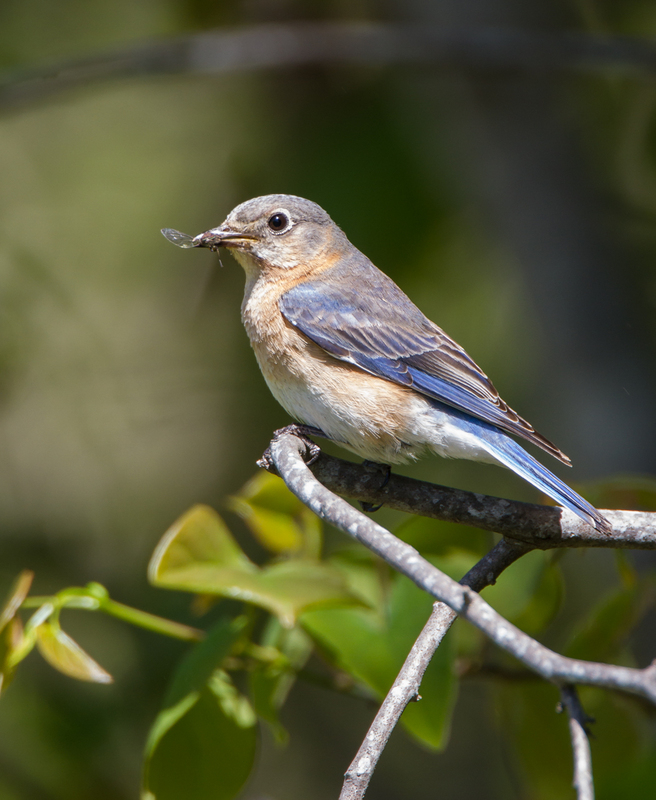 Bluebirds are among the most beloved of our songbirds. They are beautiful, they have a pleasing song (and are one of the first birds to sing every morning here), and are readily attracted to be our neighbors if we put up an appropriate nest box. They are also pretty tolerant of our presence, so it is fun to spend time observing them and photographing their behavior. 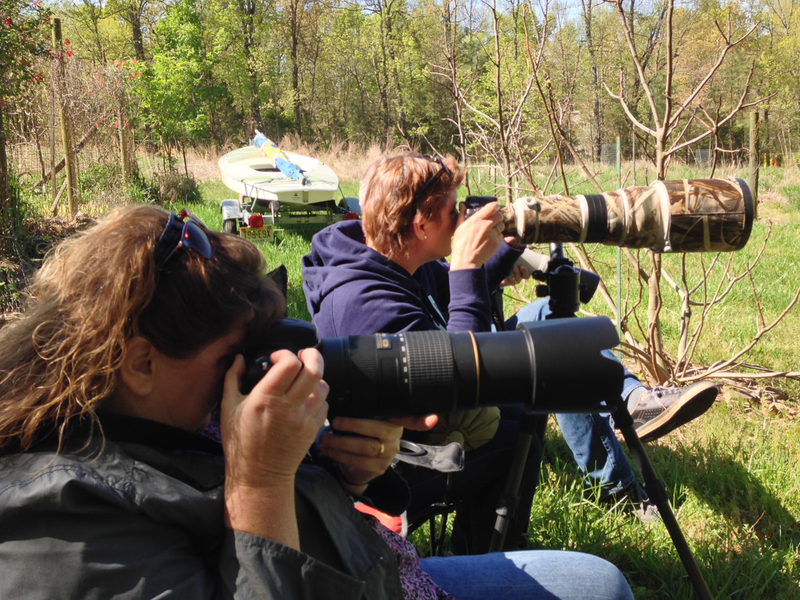 Such was the case a few days ago when I hosted some clients (and friends) from the Netherlands out to the house to photograph some our North Carolina songbirds. There’s nothing like the reaction of visitors from another land to help you appreciate the uncommon beauty of our everyday species such as Northern Cardinals, Ruby-throated Hummingbirds, and Eastern Bluebirds. I put out some lawn chairs where we could observe the nest box without disturbing the birds and we managed to spend over an hour watching the comings and goings of the busy parents. The reason for all this activity was the five hungry bellies inside the nest box. My friends got some great images of the parents as they ferried a variety of meals to their fuzzy young. I had loaned a lens so I was just watching the procession, but was also making mental notes on where the birds landed on their approaches and what they were catching for food. I spent the next couple of days sitting near the box for an hour or two each day to photograph the dynamic duo as they practiced the art of bird parenting. 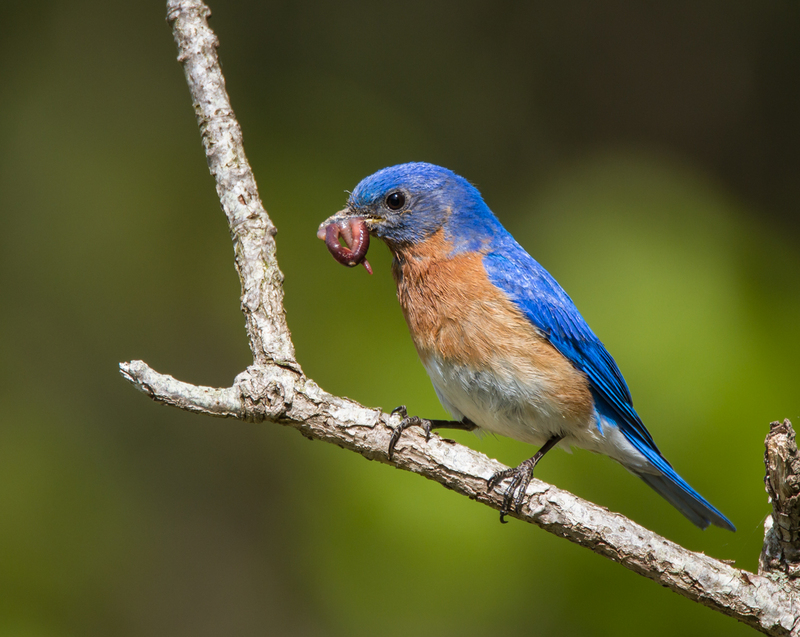 So, Thoreau told me what the Bluebird carries on its back and now I have a better idea of what they put in their belly. One of their favorite perches near the nest box is a fence post. In fact, there are several fence posts scattered under the power line that they regularly use as perches for scouting the grasses for food. Two larger diameter fence posts are also favorite places for the male to subdue some of the large prey he regularly brings to the young. He is particularly adept at spotting and catching the apparently abundant large grubs of Green June Beetles. I wrote about these unusual grubs in one of my early posts (see Crawling on Your Back – Doing the Grub). 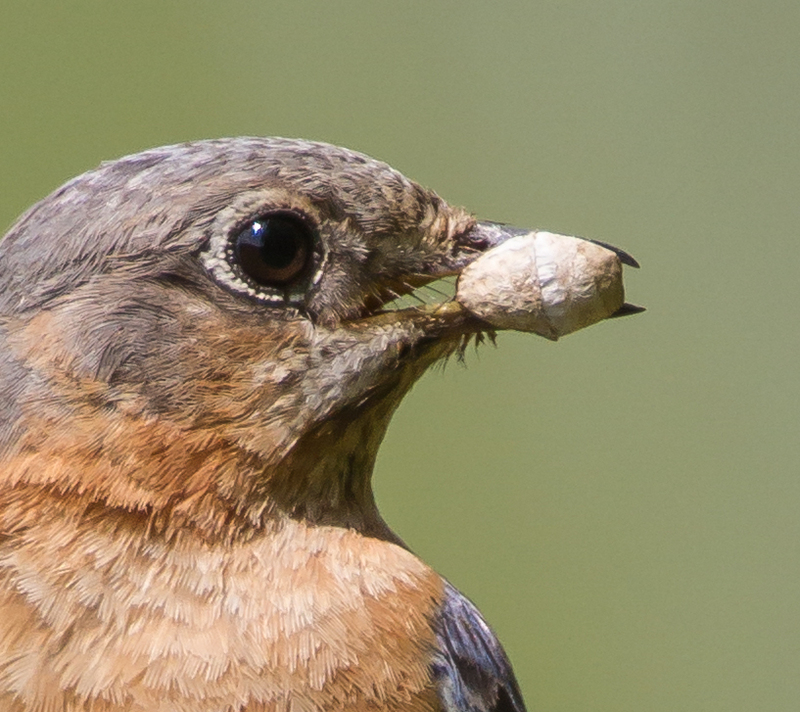 Once he grabs one of these behemoths, the male Bluebird will fly to a post and begin to slam the grub onto the wood using quick up and down and side to side motions of his head while dangling the grub from his beak. When the grub is sufficiently dazed, the male carries it to the nest box. I am amazed that any of the current babies can actually swallow one of these things, but swallow they must, as this seems to be one of the primary food items that the male captures. In my observations these past few days, the second most common food brought in by the male is worms. Often, he will have more than one crammed in his beak, and, occasionally, will add a condiment of a beetle or other insect. The female tends to bring smaller items – spiders, flies, and small insects (although she did bring in a small lizard, a Ground Skink, on the day I was just observing). She is much more cautious than the male and approaches the nest box slowly when I am out in the chair. She often flies behind the box and perches in a tree where it can be tough to get an image without a lot of background busyness. 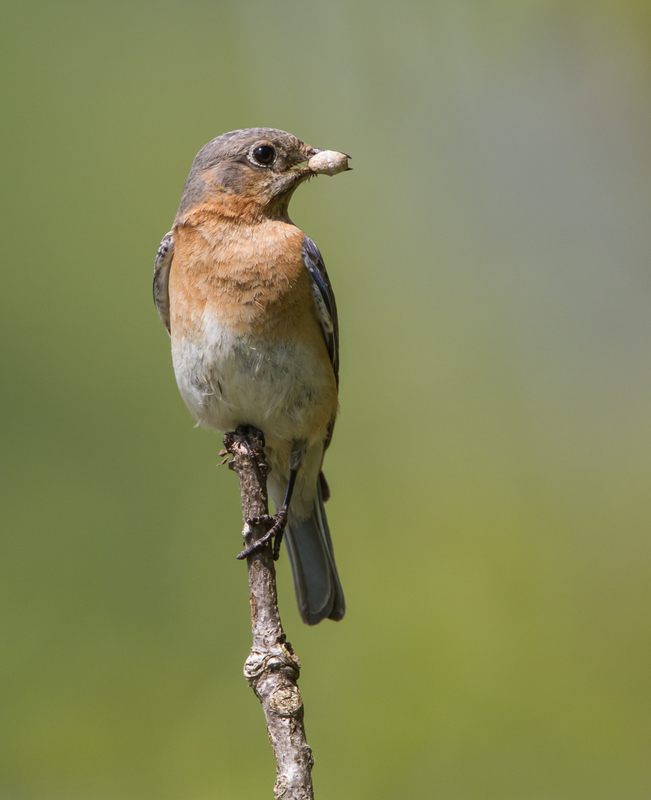 To help with the backgrounds, I often put out natural perches near areas I want to photograph birds. 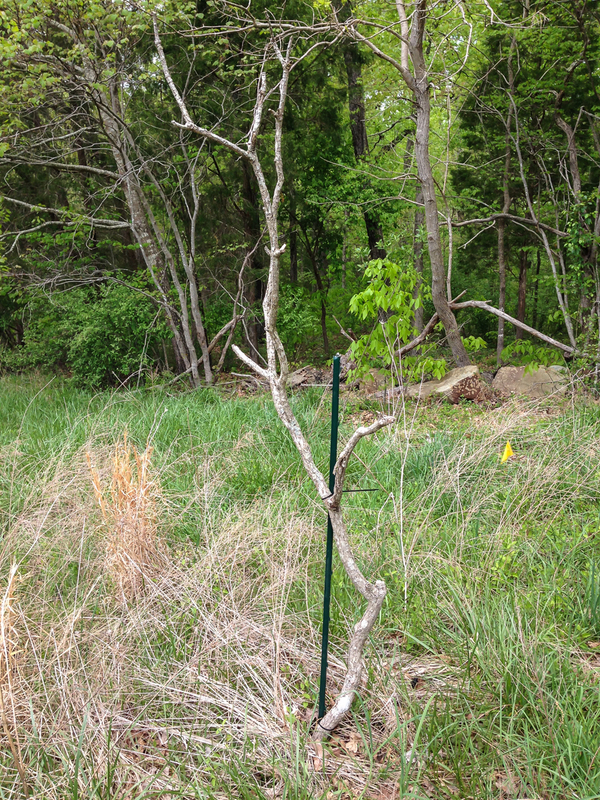 In this case, I tapped a metal fence post into the ground and fastened a dead branch to it with cable ties. This allows quick a set up and I can easily change the branch for a different look. The female seems to like this particular perch more than the male and often lands on it as she approaches. 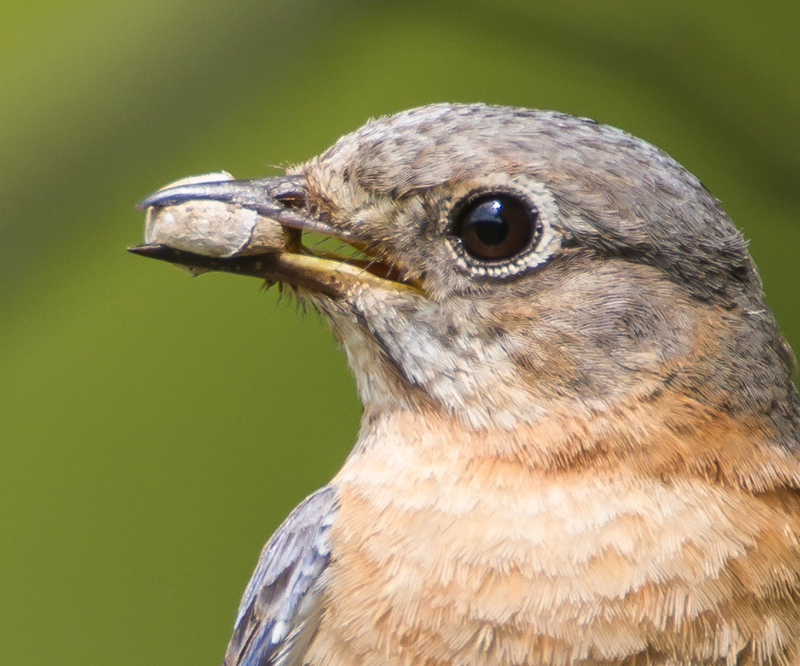 Here she has two food items in her beak – what looks like some sort of grasshopper and a glow worm (lightning bug larva). On two of her trips, she brought a food item which I have yet to identify. It is an amorphous blob, perhaps a cocoon or egg mass of some sort? On one side, there is some faint striping. When she turned her head, it looks almost like there is a thin veil-like cover on part of it. If anyone has any ideas as to what this may be, please drop me a note. I have seen her bring two items like this over the past two days. 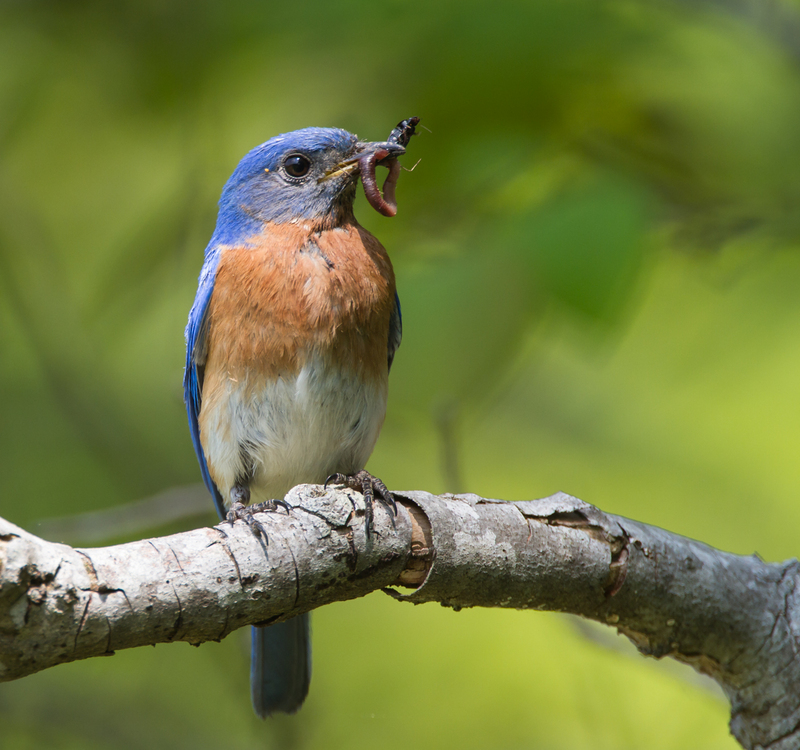 In addition to these busy parents, there is another pair of bluebirds raising young in one of my hollow log nest boxes a few hundred feet up the power line. I haven’t spent as much time with them, but they are also bringing food to their young. I saw the female with a fly of some sort and the male brought in a few crickets and worms. It is impressive to see the quantity and variety of prey these birds capture. 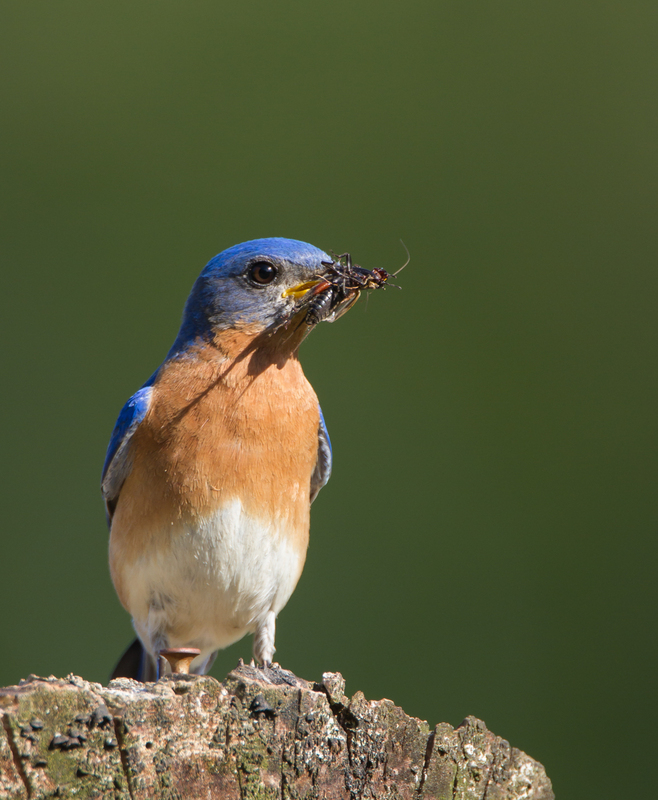 It is also important to understand how it can be so harmful to these, and so many other species, if the areas they forage in contain significant amounts of harmful pesticides or herbicides. I may have another few days worth of watching until the nestlings fledge. 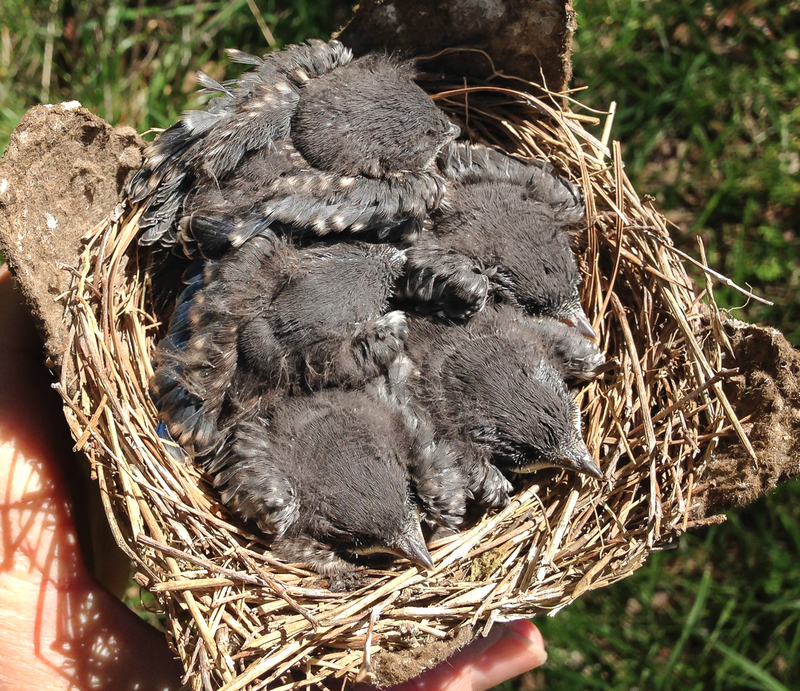 But, I am anticipating at least one more nest from each of these parental pairs before summer’s end. 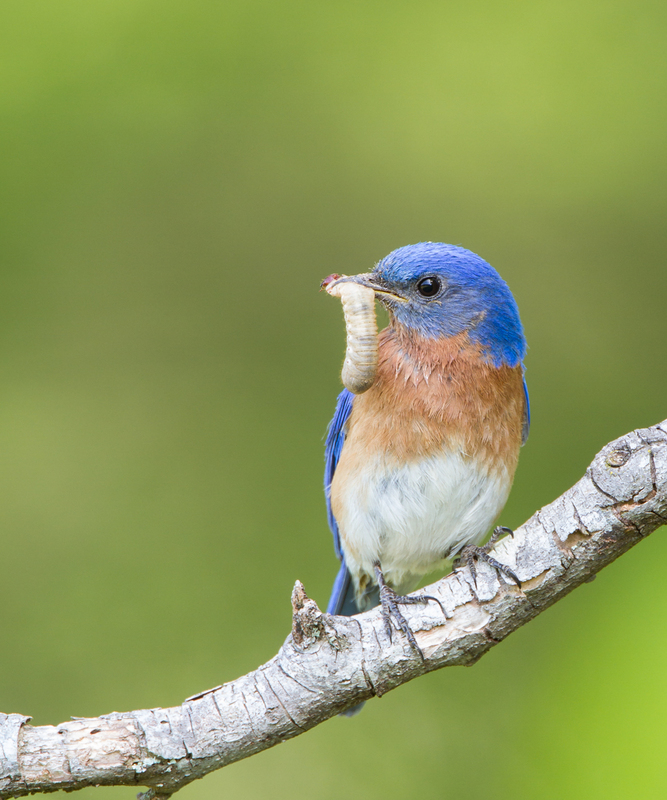 Another reason that Bluebirds are a favorite of so many bird lovers. 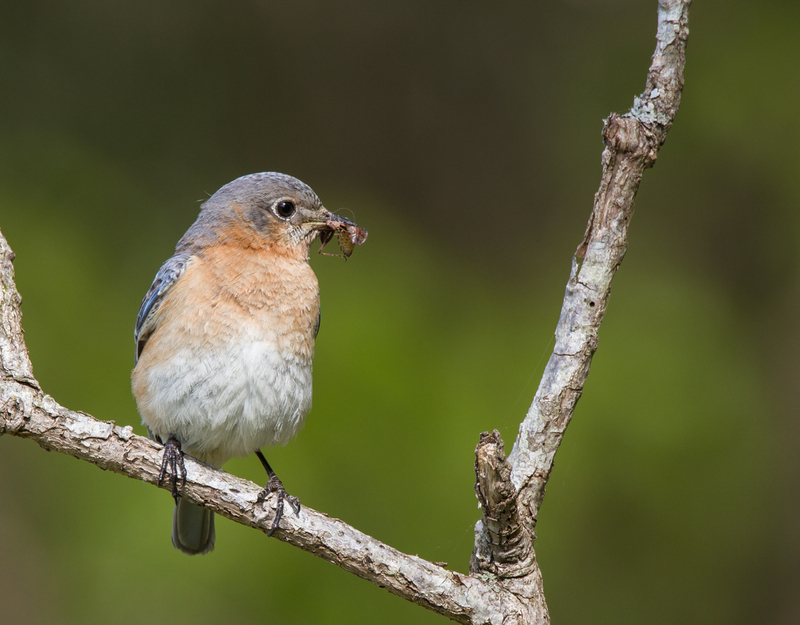 This entry was posted in Attracting Wildlife, Natural History, Nature Photography and tagged bluebird nest box, eastern bluebird by roadsendnaturalist. Bookmark the permalink. Amazing pictures Mike. Abolutely beautiful. 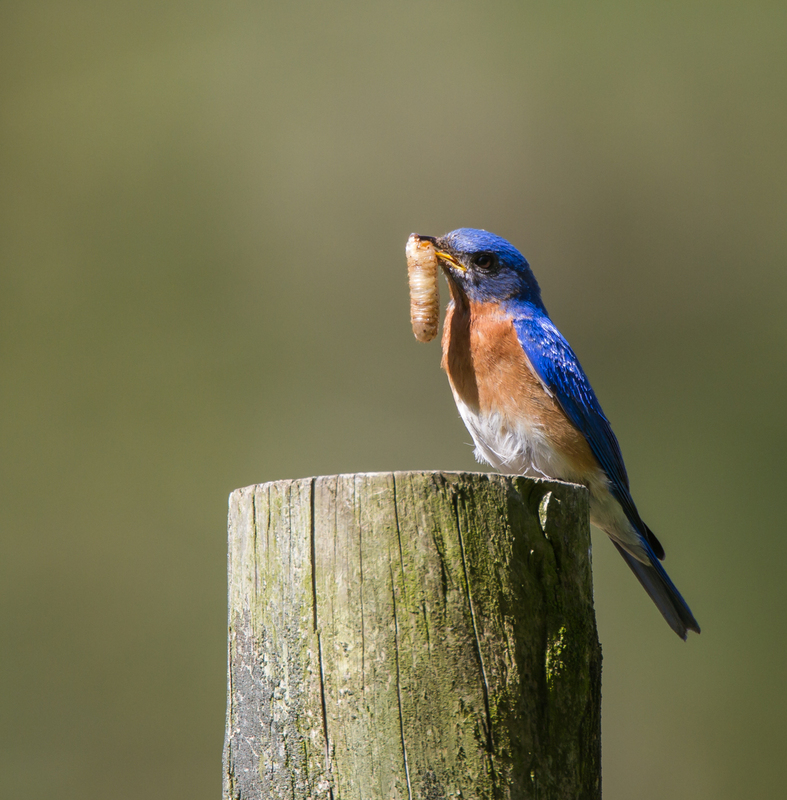 Thanks again for having us witness the bluebirds feeding their little ones. Best bluebird day ever! B.t.w. Just read on a Dutch birding website that approx. 250 Dutch birders came out to see an American Robin yesterday. Go figure! 😉 First time ever that the Robin has been seen in The Netherlands. Can’t imagine the crowd if a Bluebird does.